In the Civil War’s bloodiest battle the forces of north and south fought on the battlefields of Gettysburg, Pa. It was a turning point for the war and 149 years later troops gathered again near the same place to reenact the battles. The event drew the attention of The Pentagon Channel, a cable and satellite channel for and about the US Defense Department community. Any military topic, past or present, can be presented on the 24/7 international channel. One program, “Recon,” is a half-hour monthly program that explores military topics in greater detail. 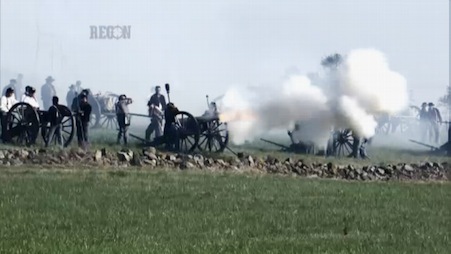 On a hot weekend in early July photographer Peter Roof and producer Terese Schlachter went to the reenactment and found many interesting subjects. Photographer Arik Dashevsky shot additional material on a third day. The pair trudged all over with an HD camera, tripod, and a bag full of batteries and XDcam disks to get all the angles. A few Hero point-of-view cameras were deployed to get a personal perspective. The battles are played out in a choreographed manner ... with a little improv. Special attention is paid to authenticity. The well being of two and four-legged participants is of high priority. Water stations are everywhere and events were rescheduled to avoid the hottest part of the day. The actual battles in 1865 occurred on 85˚F days. Temperatures on this reenactment approached 100˚F. Around the battlefield were encampments where participants live as they did in the time. For the public there were tents where they could buy reproductions and hear stories about the history. The single episode is less than a half-hour. Please click here to watch.